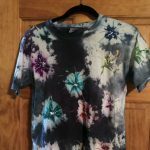 This Personalized Tie Dye Tee Shirt would be a fun activity for a summer party or camp outing. Make sure to tell the parents that their kids may be getting messy and old clothes are a must. Lay tee shirt on a flat surface and place stickers to spell your name. Press stickers firmly in place. Hang tee from a fence or tree. Mix 1 part paint with 18 parts water in a spray bottle. You'll need a spray bottle for each color or you can wash a bottle out between colors. I recommend separate spray bottles. Shake until evenly mixed. Stand about 4 to 6 feet from the shirt and spray. Experiment with the spray bottle nozzle to get a fine spray or a heavier spray. Make sure to get a lot of color around the stickers but leave other areas white for a more interesting effect. Let hang dry for a few hours. 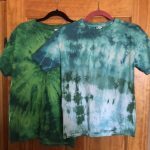 Before washing, set the paint by drying tee shirt in a hot dryer for ten minutes. Note: This project is best done outside where spray mess will not be a problem. Always good to check the direction of the breeze before you start to spray.